In Colorado, marijuana made more money than alcohol when it came to tax revenue. The state, which legalized cannabis for recreational use in 2012, collected a cool $70 million in marijuana taxes between July 2014 to June 2015. Alcohol-specific taxes brought in $42 million. Colorado held a tax-free holiday for marijuana on Wednesday, Forbes reports. As a result of the state raising too much money, most taxes on recreational pot were suspended for the entire day, due to Colorado’s taxing structure. 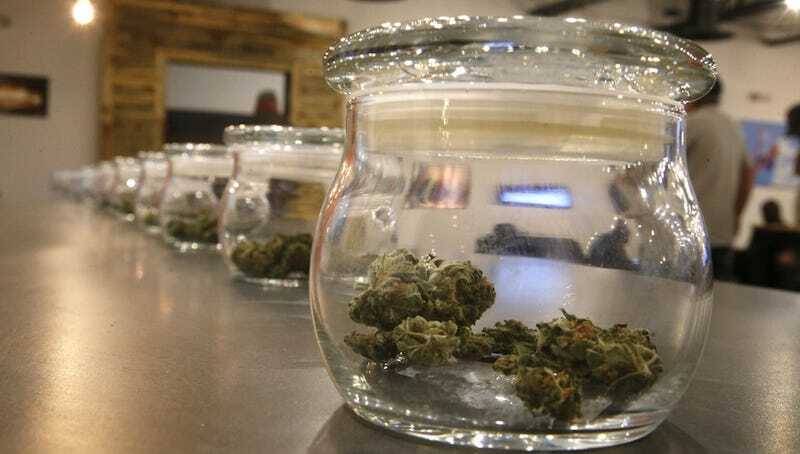 “Marijuana taxes have been incredibly productive over the past year, so this tax holiday is a much-deserved day off,” Mason Tvert, director of communications for the Marijuana Policy Project, told the Colorado Spring Business Journal. “This will be the one day out of the year when the state won’t generate significant revenue. Over the other 364 days, it will bring in tens of millions of dollars that will be reinvested in our state.” Officials estimated the state will have lost out on $3.7 million due to the holiday. Mere pennies! In November, voters will have to decide whether to give the state permission to keep the extra revenue, or refund all $66 million of it. If the state keeps the cash, it could be spent on schools and other programs. If they vote for the money to be returned to the public, taxpayers could receive $6-$16 dollars while the rest would be refunded to marijuana growers.